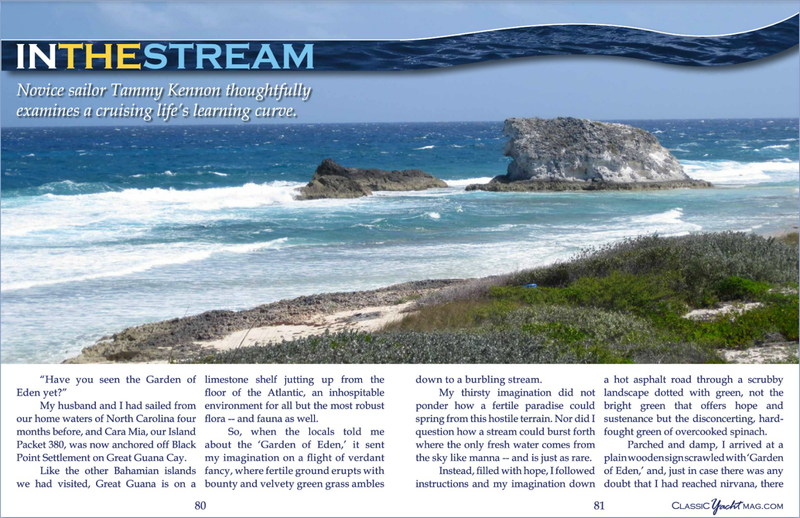 My column, InTheStream, was published in Classic Yacht online magazine from May 2012 to July 2014. The column tracks my first year of cruising, pondering the lessons I learned along the way -- the hard way. The overall theme mirrors the book I'm writing about the life lessons that come calling when a 50-something woman deep sixes her whole life and follows a dream. WARNING: If you are on limited bandwidth, don't click on the headline links. That loads the whole magazine. Instead, use the PDF version, a low bandwidth option. "It was October 2010, and I was a five-day-old cruiser. I was in the midst of a hands-on lesson in windlass operation, and I was failing." "...why am I out here moving at this pace if not to experience each mile, to tune my senses to nature's voice, to plod, to gawk, to have no shame in feeling wonder?" "BOOM! An eerie white ghost with gaping black eyes burst up out of the darkness, hovering 20 yards from my heart, which was now in my throat -- screaming." "Could it be that after years of frightening expectations I had made it across the Gulf Stream with no great sailing yarn to tell, nothing more exciting than a flock of flying fish, nothing more traumatic than yacking over the rail?" "We had reached the confluence of dreaming and reality and were about to discover the difference." "It is Mother Ocean who weaves us together as our paths cross and diverge and cross again. She stretches out our hours like rubber bands, giving us wide open time to listen and be heard." "I check my watch and the wind speed. I wonder if we'll keep this pace, and if the wind will keep a constant breath, if that cloud far off to the east is headed our way... I am reminded of the things that matter and the ones that don't." "When I climbed this lighthouse the first time three years ago, I only had the vaguest notion about its inner workings and the labor involved in keeping it running. I had the same vague notion of the tedious work that lay ahead for us in the next few years as we arranged our lives to go sailing." "Cara Mia had paid the price for our mistakes, schooling us in the value of good seamanship -- and a new meaning of seakindliness that would serve us on land and sea." "This tiny island was proof that dreams are not granted based on gender or youth but rather on the tenacity of your spirit and the strength of your grasp."